CPM Engineering are one of only 50 service centres worldwide and the only one outside of North America to achieve EASA’s accreditation. This third-party audited scheme provides the guarantee for the users of electric motors that by using ‘best practices’, the energy efficiency of their machines is maintained and the reliability returned to that when the motor was initially purchased, or better. The benefits of this programme extend beyond the motor shaft; in this instance, to the driven component – the pump. When installing a motor/pump set from new or after repair, it should be correctly specified, aligned and free of restrictions. The base should be in good condition. Centrifugal, geared, slurry, liquid ring and self-priming pumps all have an electric motor driving them. A properly repaired and maintained system will often save thousands of pounds each year in reduced energy consumption, in addition to the savings achieved by increasing the Mean Time Between Failures (MTBF). We would suggest that regular servicing is not just important from a technical and cost-saving perspective; our experience indicates that serious safety issues can develop. Incorrectly aligned systems vibrate, couplings can fail and components have been known to be projected from such machines. Having your motor repaired using ‘best practices’ results in less vibration, thus decreasing the risk of possible damage. As you may know from our July post, motor failures can be to an extent restrained; the same applies to pumps. You will need fewer maintenance services as lifetime of the seals and bearings is longer than usual thanks to the strict procedures we follow in electric motor repair as required from an EASA accredited facility. 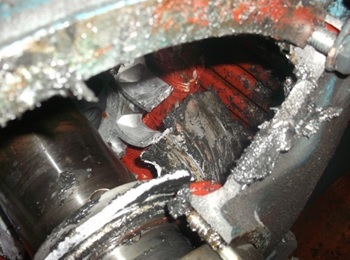 CPM have seen misalignment result in catastrophic incidents with motors ripped from their mountings and components projected through the air. These occur when plant is not maintained. To assure your plant doesn’t practice this, read our suggestions on alignment. Shaft wear and pitting marks are often caused by pump cavitation but can be easily detected during examinations. Click here to read about the symptoms of pump cavitation and how to avoid it. We don’t see our repairs in a ‘one solution fits all’ way; we consider each machine on an individual basis, paying every attention to its background and the conditions it works in. Every pump will be subjected to a developed system designed to identify the root cause of its failure. Only at this stage can a scope of work be developed. All repaired motors and pumps at CPM will be properly tested to see if they comply with their design criteria. A test rig can produce pump curves which are compared to those of the Original Equipment Manufacturers to ensure compliance. It also ensures that the seals are not leaking and the vibration is within specification. Whatever the problem with your pump, we will repair or even rebuild it to the OEM standard. And if there’s an electric motor running it, it will have EASA’s sticker to remind you how fine the repair was. Call us for a quote now on 0161 865 6161.